We are leading manufacturer of Casement Door. A Casement Door is a movable structure used to close off an entrance, typically consisting of a panel that swings on hinges. When open, they admit ventilation and light. The door is used to control the physical atmosphere within a space by enclosing the air drafts, so that interiors may be more effectively heated or cooled. Doors are significant in preventing the spread of fire. They also act as a barrier to noise. 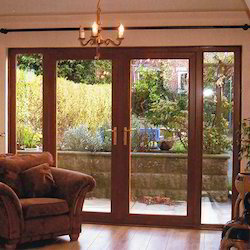 The casement doors work on inwards and outward opening mechanism. It opens inside or outside with the help of outer sash frame. These doors are provided with multi-locking and center locking with key that gives more security to the system.